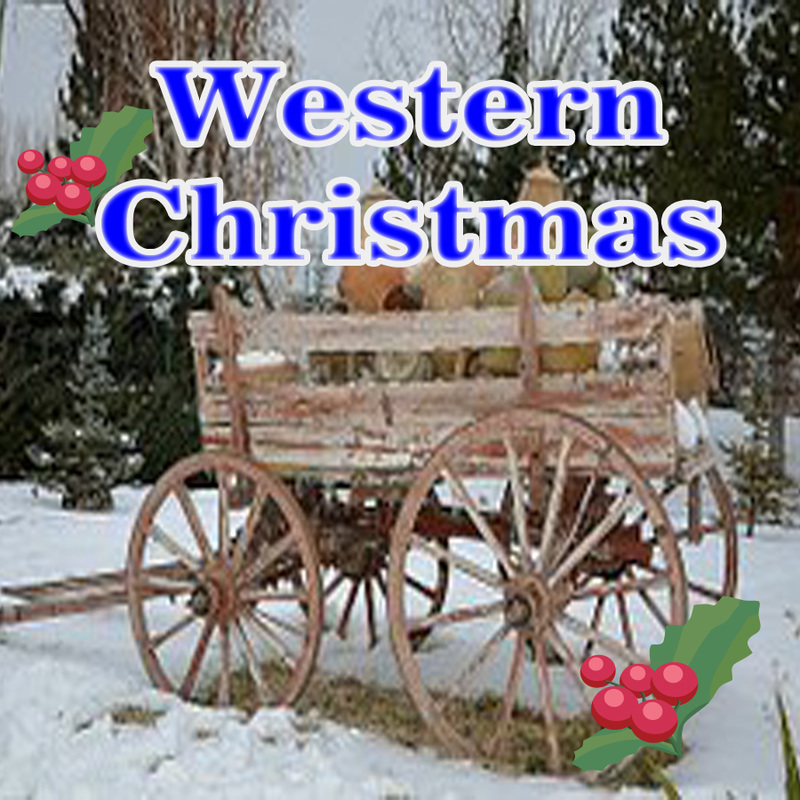 If you have been over to my home page or most any of the pages on my site, you know that I love western stuff. 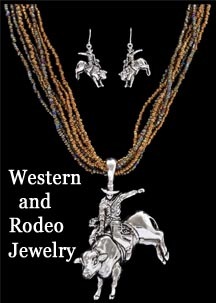 This page has some nice western and rodeo jewelry pieces that you may like. You will find something for girls and guys. 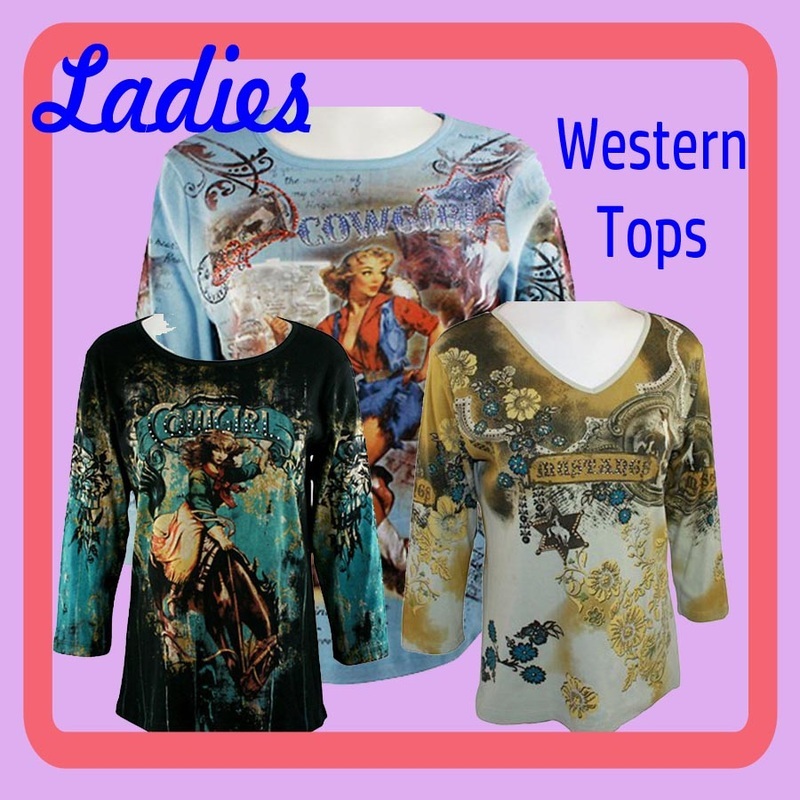 Jewelry always make a nice gift, and when it relates to something special in their life like horses and rodeos, you will have a very memorable gift that he or she will love. Stick to your guns and don't let anyone break your heart. You can get that point across with this necklace and chain accented with a pistol. It is a 3/4 inch gold tone floating charm on an adjustable 16 to 18 in chain. It is nickel and lead safe for those with allergies to some metals used in jewelry. This western belt buckle style necklace has a horseshoe nail cross in the center that is wrapped with wire. There are large crystal rhinestones on the buckle and it has an 18' black leather cord necklace. For your wrist, this goldtone stretch bracelet has the style of a western belt buckle also. It has crystals on the buckle. There's nothing like having a little barbed wire in your wardrobe. It looks good as an accent to this matching set with necklace and earrings. 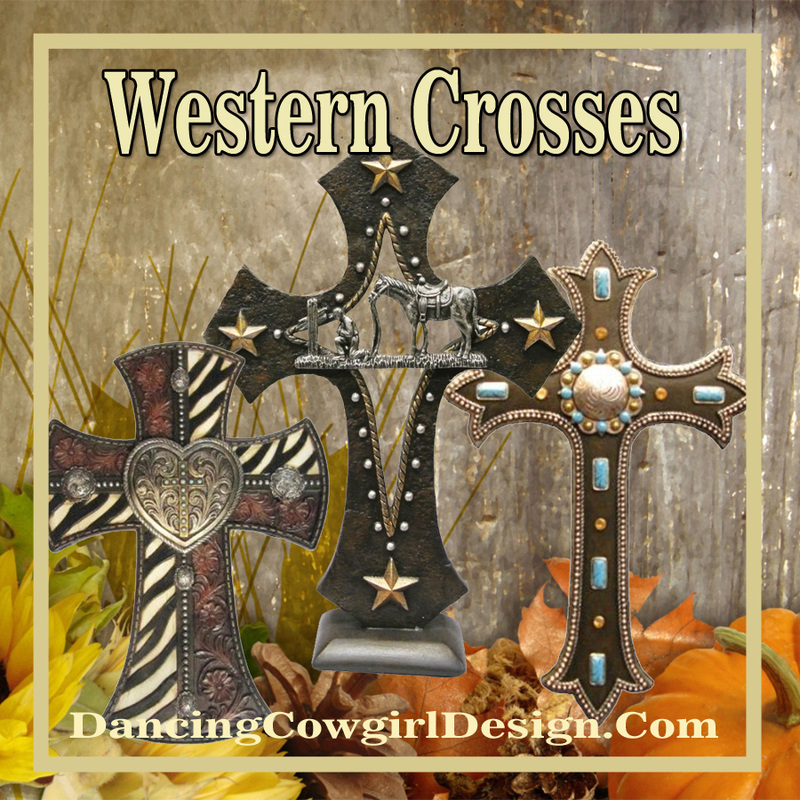 Western crosses are available on several styles of necklaces, bracelets, earrings and belt buckles. This is labeled as men's, but I don't see anything about it that would not be fine for women to wear as well. It has an 18 inch chain and is also lead and nickle free. These are post style pierced earrings that are 1.875 inches long. The post are made from hypo-allergenic surgical steel. Team roping fans will enjoy this set with the necklace and ear rings. Guys this would be a nice gift for the woman who supports you through miles of road and hours at a roping. I wonder if George Straits wife has any team roping jewelry? Here is an eight string brown bead necklace with a bull rider pendant that would be nice to add to a western outfit for any event. The necklace is 24 inches long. It comes with the matching earrings. This is an authentic Black Hills Gold Silver Barrel Racer Necklace in the Black Hills Gold Jewelry style of 12k red-gold and 12k green-gold leaves on diamond cut edge sterling silver base with barrel and racer in black. The necklace has an 18 inch chain. This also has a lifetime warranty. This barrel racer necklace also has Black Hills Gold and has a lifetime warranty. Matching earrings are available separately. You can get these barrel racer earrings in either surgical steel post or fishhook design. They are lead and nickle free. Just want a charm to add to a bracelet or on a chain? This is the matching charm for the barrel racer earrings. Start something. A charm bracelet is a good place to wear collectable momentos from your life. Start a charm bracelet of your own and add to it when you find a new charm you like. Charm bracelets are a good gift idea because when it's time to give that same person a gift for the next birthday or other occassion, get them another charm to add to their bracelet. This is an Allan Robin design with mulit-strand faux leather. It has a lobster claw clasp and 2 charms. "Rodeo Girl" Comes On A Bracelet Of Your Choice: Lobster Clasp Chain, Toggle Chain, Brown Suede Leatherette, Or Black Suede Leatherette. Both Styles Have A Lobster Clasp. You can get the charm with out a bracelet. Use this charm for a mens bullrider necklace. Add a chain or leather cord. This one has a pink braided bracelet with a bronc rider and horse charm. This is sweet little bracelet that little horse loving girls will adore. ​​These handmade bracelets come in 3 different colors. They are made of synthetic leather with velvet wrapped together. The heart shaped necklace with a girl feeding her horse comes in several color combinations. Besides the two shown here there is also arose gold color and a gold horse and the girl in silver and other combinations like that. ​Sterling Silver White Topaz Girl Feeding Her Horse Open Heart Pendant Necklace, 18"
​Perfect gift idea for a horse lover. This horse quote necklace has an 18 inch chain with a lobster clasp. The charm is 1 inch in diameter and is made of silver tone solid metal allay.